So this is post number two in the Summer Series, you can find the first one here. This time I'm looking at nails. Summer is always the perfect time for bright colours of course, but Summer 2013 seems to be all about really bright neon colours. So I think this bright orange is a perfect addition to any summer collection. 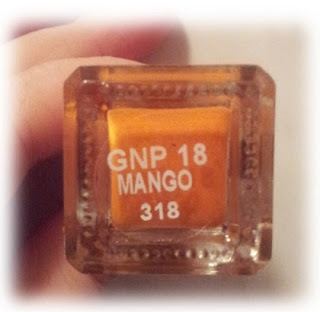 This is Barry M's Gelly Nail Paint in the colour Mango. The finish of this nail varnish is great and the colour is so bold. It reminds of Shellac nails in the finish actually. So you get expensive looking nails, without the expensive price tag. I picked this one up on ASOS for €5.29. So it is a really affordable polish. However with the reduced price tag, does come reduction in quality. I find it applies quite streaky and sticky initially and it starts drying quite quickly, so if you're trying to fix an error, you can make a mess of your nails. However as it is drying, it does tend to smooth itself out. So my nails above are on my first attempt. As I was applying it, I didn't imagine it would turn out so well. So just be patient with it. Of course since this is such a bright colour, be certain to apply a base coat (if this something you would normally skip) since it would be very likely stain your nail. Finally in my experience, it didn't chip until the third day, which for the price, is very good going. Overall I was impressed with this polish and I think it's a perfect shade for Summer 2013! Have you tried the Barry M Gelly Nail Paints? What are some of your favourite shades for summer?